Mountains, valleys, villages and roads — I just can’t stop exploring. The city of Los Santos Reyes de Nopala is on a mountain just west of San Gabriel. The 11-km paved road from San Gabriel is in excellent condition. If you turn left after the bridge at the entrance to Nopala, you will find a good, dirt road that leads to Santiago Cuixtla, an agencia municipal of Nopala in the valley south-west of that city. Until last December that was about as far as you could go by car. 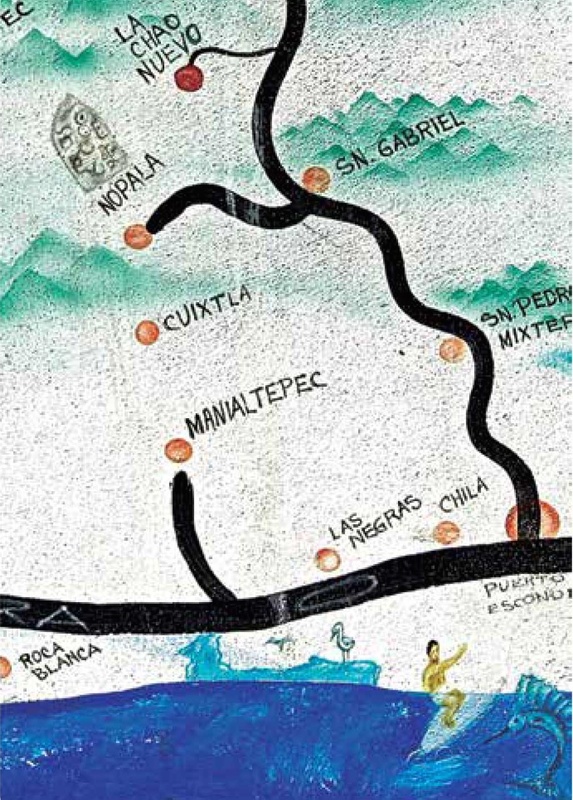 Now, however, a two-lane road is being built that will connect Cuixtla to San José Manialtepec. San José Manialtepec is located just north of the Coastal Highway (200) and already has a two-lane paved road to the highway. The town is a half an hour from Puerto. The turn-off is near the west end of the Manialtepec Lagoon at the 116 km marker. The new road will be a great boon for the region’s farmers and ranchers since it will greatly shorten their travel time to markets in Puerto Escondido and Río Grande. It will also benefit tourists since it will also go to the hot springs of Atotonilco. 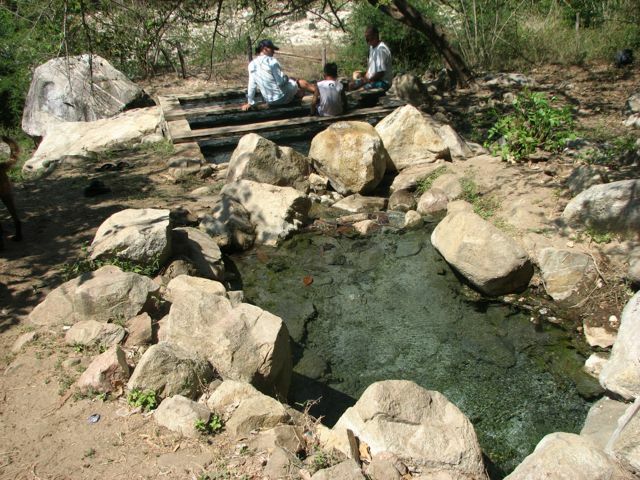 The Atotonilco hot springs are a favorite tourist attraction in the hills above the Manialtepec Lagoon. It’s only an hour by horseback from San José Manialtepec. There are no roads or bridges that cross the meandering Manialtepec River and the horses cross the river at five different points. I confess to have never been to Atotonilco; I worry about my back. 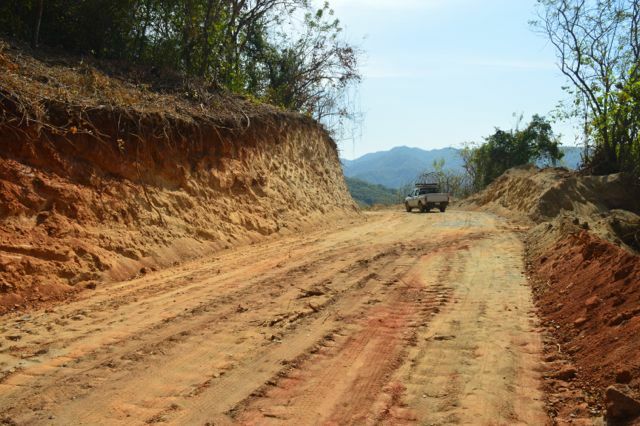 The new road should be completed by the end of 2015 and may be paved in 2016. Eventually it will be part of a tourist corridor that will reach the waterfalls of San Juan Lachao Nuevo. 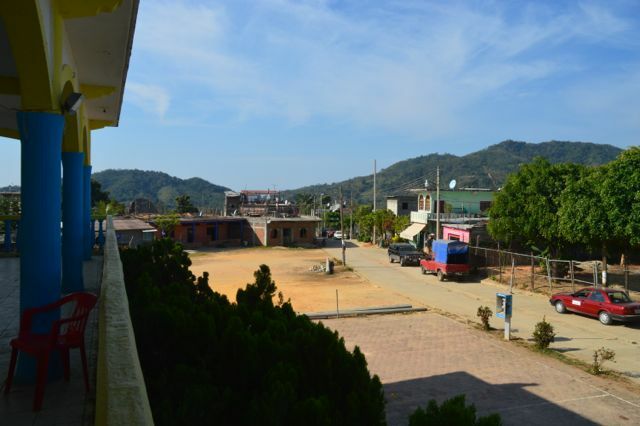 The Bienes Comunales (communal lands) of Santiago Cuixtla extend into the Municipio of Tututepec and include Tututepec’s coastal communities of Puerto Suelo, Hidalgo and San Isidro de Llano Grande. The beach between Puerto Suelo at the southwest end of the Manialtepec Lagoon and the bluff known as La Vigía is called El Mirador. There you will find Casa Wabi and the Hotel Escondido. 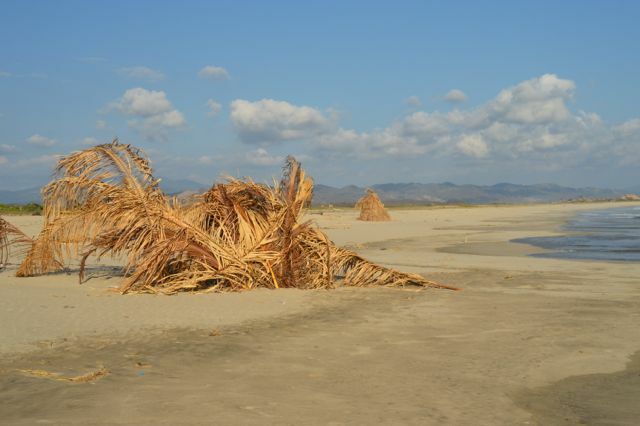 The beach is also used by local fishermen who bring in palm leaves for shelter. See ¡Viva Puerto! #6 for info on Puerto Suelo and #2 for info on San Juan Lachao Nuevo. For trips by horseback to Atotomilco contact Javier Santos at 954 135-0188. Cuixtla-San José Manialtepec Road, Feb. 2015.